December 2009: We are living in the St. Johns area about a half mile farther out from the bridge. Leslie Porter and I have been married for 27 years. Our only, Daniel, graduated from UP last May. I’m in my 11th year with the Department of Human Services and recently joined the new Continuous Improvement Unit of the Children, Adults and Families division. 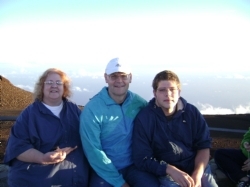 The picture shows us on Maui, at the summit of Haleakala, where we vacationed for the first time in November. The daytime and sunset views were amazing, but the starscape eclipsed them both. We want to go back… forever.